Today you’re going to learn how to solve 4 specific problems using compression. Once you have these techniques in your back pocket, it’s easy to pull them out in the heat of a mix and quickly solve one of these problems. Today you are going to learn how to solve four specific problems with compression and those problems are inconsistent volume, too much attack, not enough sustain and losing low-level details. Because once you have these techniques in your back pocket, it’s easy to pull them out in the heat of the mix and quickly solve one of these problems. And as ever, don’t forget to download the free compression cheat sheet while you are here. Rob Mayzes here from Musician on a Mission, hope you are having an incredible week. I am going to dive right in here with the first problem, which is inconsistent volume. So here we’ve got a bass pop. So already quite consistent. This was tracked with a compression peddle, so it’s already got some compression, and then we have this section here. And this is actually quite a bit in the song. So we are not trying to bring this up as much as it’s just this [inaudible 00:01:03] here going into this. The volume is quite inconsistent because it’s quite emotive. So this is probably how you will find yourself problem-solving with compression the most. 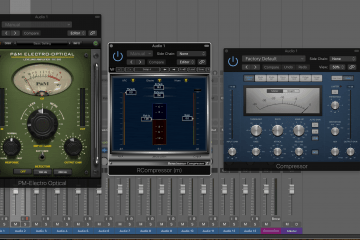 The main use case for compression is making the volume more consistent so that could be on the bass, kick, snare, vocals usually, but it could be also be on guitars, it could be on pianos, it could be on backend vocals, could be anything. And it’s really easy to solve this issue. We just need to add some compression and make sure we are not really squashing it too much. 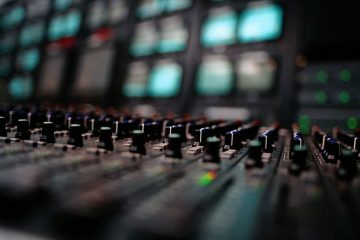 Because if we are applying compression with the intention of controlling the dynamics and the volume, then maybe we don’t want to affect the tone too much. Normally, you end up doing both, but if you are going into this like, hey I want to make this vocal sound really punchy, then obviously you are going to use the compression in a very different way to thinking, hmm, this bass sounds good, it’s just a bit inconsistent. So instead here what we are trying to do is make it a bit more transparent. We are trying to add compression to level up those dynamics without necessarily really changing the tone and the smaller scale kind of micro dynamics, the attack of the notes and that kind of stuff. So let’s start by just dialing in enough compression to make this a bit more consistent. So we only really want to compress these louder notes. So what we can do is use a higher ratio and just adjust the threshold so that it’s only really coming in on these louder notes and then dropping those within these other notes on as affected. So we got the threshold in the right place, let’s try increasing that ratio so that we are compressing those notes a little more. Cool. And honestly, when you are using compression in this way, you don’t have to spend as much time on the attack, the release, the knee. So I am just going to loop that section now and adjust those controls a bit just to see if we can make it sound a bit more transparent. I don’t like the way that [inaudible 00:03:19] string is really poking out, so I am going to use a faster attack to try and catch that too. So we will come back to this idea in a moment because we are going to be doing this on the guitar as well. But with a faster attack and faster release, we are catching that [inaudible 00:03:43] a little bit and taming it. Okay, now let’s just check the make up gain and bypass a few times. What we are really listening to is the notes after that fill because we want these to be the same volume, we are trying to reduce the volume of these, so it doesn’t actually need that much if any make up gain, because these notes here are pretty unaffected, we are only really capturing those. So there you go, that’s how you can control dynamics whether it’s just by catching a few louder notes or instead we could just use a lower ratio and a lower threshold to just make the volume a bit more consistent in general and compress everything by a smaller amount. So two approaches there, just catch the peaks or just add general compression to level out the dynamics at all points. Okay, so let’s move on now to the next problem that you can solve with compression and that’s attack. So we’ve got this kind of [inaudible 00:04:47] the guitar sound. It’s been slowed down a little bit so it sounds kind of odd, but it the context of the mix, it sounded fine. But what stood out for me here is this sustained part. But then where the peak is hitting the strings it’s coming out quite a lot and that’s making it poke out in the mix. What I wanted to do was reduce those peaks so I could bring up the whole part, so we still have those sustained [inaudible 00:05:07] notes, filling out that space in the mix but without really poking out. So to do that, you already saw me do this to an extent on the bass. And we just want to use a fast attack to catch those transients and then a fast release too to reduce the volume back down to normal before the sustain comes in. So we are just trying to catch the peak, hitting the string but then we are not trying to compress the sustain. So we need to come down really quick to catch our peak and then we need to let go really quick to make sure we are not compressing the sustain. So we want to do a similar thing again where we are just going to try and catch the peak without catching too much of the sustain. So to do that we are going to need a higher ratio. And often the easiest way to do this is just use the attack and the release as fast as they will go. We are going to get rid of that knee as well because we want to quite aggressively capture those peaks. So now let’s adjust the make up gain and see if that’s doing what we want it to do. And again we don’t really need any, because we are not clamping down on the sustain too much, we are reducing the volume of peaks but we are not reducing the volume of the sustain too much. So really we don’t need to add any make up gain. So we are really catching that peak and reducing the attack of the note there so that those ringing notes come out a little more. So this happens quite often on guitars is when a bassist is really digging into the strings. Some with the guitar, as if they are really hitting the strings with a lot of attack on the peak and it sounds a bit too jarring or it’s poking out the mix a bit too much. This is also a great way to put an instrument further back in the mix, because by reducing those transients it will sit further away from the listener. So if we wanted this guitar part to sit behind the vocal, behind the lead guitar, etc., by reducing those transients it sounds a bit duller, it sounds a bit further away because it doesn’t poke out the mix as much. Now, the next problem we can solve with compression is increasing sustain. And this is going to be in a similar way to reducing attack, except for now we are going to use a slow release instead. Because what we want to do is catch the attack and in this case we are using snare. And the snare doesn’t have that much body or sustain to it, so we are going to try and catch that initial transient where the stick is hitting the snare with a fast attack time. But then instead of using a fast release time to then really quickly let go of it, we want to use a slow release, so that it kind of counterbalances the sustain. As the snare rings out, the compressor slowly brings up more and more, so they kind of counteract each other. Let’s start by just putting a gate on here so that we can really tweak this without listening to the rest. And already we can start to change how the transient sounds with a gate as well, because by using a slower attack, we can dull that transient; whereas with a really fast attack, the full transient comes through. So we can start to play around with that a little bit now. Cool. And now we want to use our compressor to try and catch that transient and then slowly let go of it. And as the compressor is relaxing, the sustain of the snare is then gradually increasing in volume, so it counteracts it. So there’s really not much sustain to work with here but already the snare sounds like there has been more body to it, and that’s really what we are trying to achieve here. Obviously, if there’s nothing there, we can’t really bring it out, but in this case, it’s done what I wanted to do, it’s made the snare sound a bit less aggressive and have a bit more body to it. If it had more of a ring anyway and then we used this approach of fast attack and slow release, it would really bring that out, but in this case, it’s at least changing the kind of tonality and envelope of that snare to give it a bit more body even though it hasn’t got a noticeable sustain. On a small level, it does have a less attack and a bit more sustain. So then finally, the last use case is bringing out low-level details. This is kind of a side effect of more aggressive compression. So on a vocal, we get a lot of the emotion from the [inaudible 00:11:50] and the from the little endings of words. Just have a listen to this vocal here and listen to how when he trails off at the end of a word, there’s just so much emotion in there. There, as his voice kind of breaks. Now, a great way to bring that out is with automation, we could just turn up that part, and this is how I like to do it usually so that it really brings it out. But if you are struck for time or you don’t want to go through and automate the whole vocal, an easy way to do this is also with compression. So all we need to do is just make sure we are clamping down on the words but then not clamping down on these kind of spaces between them. So to do that, we need just a normal attack time, start somewhere around 10, 15, 20 milliseconds on a vocal. But then we just want to make sure that the release time is fast enough to let go when it gets the end of the word so those low-level details come out. So essentially, we are clamping down on the words but not the spaces between, so now in comparison, they sound louder. So let’s start by loading up the compressor. And first of all we are just going to tweak the threshold and ratio until we are compressing these notes but not compressing the gaps between as much. Cool. So now what we want to do is just adjust the release time to make sure the compressor is completely letting go before those break ups and those breaths come back in. So we are just going to have to use a slightly faster release. Now you don’t want to go all the way, because that’s going to start to sound odd. You can do it on a vocal, it’s a good way to really get as much volume out of a vocal as possible, but in this case it’s not a pop track and I just want to use a faster release time but probably kind of fast, medium, somewhere around here to make sure the compressor is relaxing before those trail offs come in. So that’s doing the trick, let’s compare. So this is before – and really focus on the difference in volume between the actual notes and then the between parts. In essence, it actually just sounds like we’ve turned those parts up. The notes, they sound compressed, they sound better but there are similar volumes, but then those bits between really are much louder now. So just really bring out those low-level details. And this isn’t just good on vocals, sometimes it works really well on more emotive guitar parts if there’s lots going on and there’s kind of small needs between that you want to bring out, it works well, sometimes on piano. Mostly on vocals though I find myself using this technique, so definitely something worth giving a go. So whenever you have a vocal that’s really emotive like this, it’s a great way to just enhance that emotion. So there you go, four problems you can solve with compression. Just keep an eye out or rather an ear out for these issues when you are mixing and have these in your back pocket. And there’s a great way just to remember how to dial in attack and release time. Normally, when you are just adding compression to change the tone and micro dynamics to make something sound more aggressive and punchy, you are using kind of medium attack and release times in the same way and you are just trying to control volume. But then these specific use cases of decreasing attack or increasing sustain or bring out low-level details, this is where we start to get into these areas where you need a fast or a slow attack or release time. 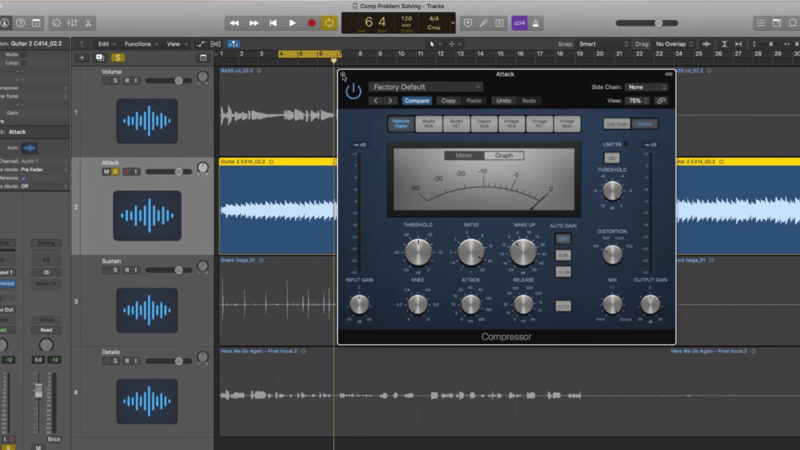 Now, of course, there’s a lot more to compression, and if you don’t truly understand how those parameters work, then you are not really going to be able to solve problems in this way until you can tweak compression, so you can really hear it. 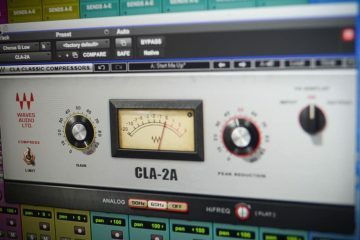 And once you get good with compression, mixing as a whole becomes so much more enjoyable. So I’ve put together a free compression cheat sheet. Download it. Use it when you are mixing and it’s going to make your mixes sound better. Trust me. There’s a link in the bio or there’s a link on the screen now. And then I want to hear from you. Comment below and tell me, which of these four techniques have you used before? Do you find using one of them more than the others? Tell us in the comments below. So that’s all from me. I will see you next week.